As the second-generation Oculus Rift headset begins to arrive some opportunists have conspired to profit from reselling their pre-orders, but Oculus VR isn't letting it happen without a fight. The company is canceling the orders of anyone caught attempting to sell their Dev Kit 2 pre-orders on eBay or elsewhere because, as Oculus Community Manager Andres Hernandez put it in the Oculus forums, "We don't allow resale of the development kit." "They are meant for developers and are not consumer products," the DK2 FAQ explains. Hernandez also noted Oculus doesn't provides provide warranties on second-hand sales. Oculus forum members have instigated something of a witch hunt for resellers, and judging by several updates from Hernandez it seems the company is doing all it can to cancel their orders. 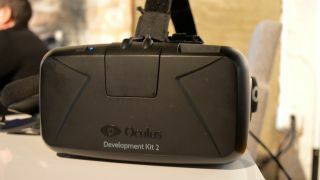 Eager developers gobbled up pre-orders of the second version of the Oculus Rift dev kit, but only 10,000 - a fraction of those ordered so far - will actually ship this month. Oculus is selling the DK2 for $350 (about £200, AU$375), but one reseller whose order was cancelled on Monday sought $5,000 (about £2,900, AU$5,340) for his or her order. The company also suspended all Oculus Rift sales in China earlier this month after detecting abnormally high resale rates there. "Yes, it is a bummer that we've had to suspend sales in China due to extreme reseller purchases," Oculus Customer Service Lead Kevin Crawford wrote on Reddit. It seems they're serious about keeping Oculus Rift in the hands of developers for now.